Le pittoresque Swinton Cottage est l'endroit idéal pour une escapade romantique ou un séjour en famille inoubliable. Situé dans la partie la plus ancienne de Niagara-on-the-Lake, cette maison centenaire est à seulement 2 minutes de marche du centre-ville de Queen Street, où vous trouverez des restaurants de classe mondiale, le Festival Shaw et boutiques locales. Vous pouvez également visiter quelques-uns des vignobles les plus célèbres de l'Ontario. Le Swinton Cottage (circa 1890), a été joliment restauré et possède tout le charme d'origine avec toutes les commodités modernes. Détendez-vous et détendez-vous dans les aventures de jours que vous nichent en face d'un feu de bois d'allumage. Savourez les vins locaux avec votre chef-d'œuvre culinaire fait dans la cuisine entièrement équipée ou profiter du jardin en plein air tout votre repas grésille sur le gril. Nous vous invitons à rester à la Swinton Cottage dans la belle ville de Niagara-on-the-Lake pour une expérience que vous ne serez jamais oublier. Vous recherchez plus d'espace? S'il vous plaît visiter notre propriété sœur à La Maison Flynn, situé à quelques pâtés de maisons. The house was absolutely gorgeous, within a quick walking distance to the Main Street in Niagara on The Lake. We thoroughly enjoyed spending our weekend away. Wonderful cottage, couldn't have asked for more. Location was perfect. Just a short walk to town. We rented the house for our family Christmas. Niagara on the Lake is beautiful and Swinton Cottage was perfect. The property is well located, and the house is very well equiped. Even the linen's are nice. The Olde Angle Pub is 3 blocks away and I would recommend walking there for dinner. And Cows Ice cream, nothing like it in the world. Lots of history in the town and fun places to explore. House is amazing and it’s location. Only complaint is that there was 1 toilet paper roll in each bathroom. Not knowing when we ran out there was none to replace it with. We had to go to buy toilet paper to last us the weekend. Quaint lovely cottage - perfect for a family get away! My husband and I and our two adult children and their partners stayed at this lovely cottage for two nights while attending a family wedding at Pillar and Post. What a great way to speeds some family time. We loved it and we’ll be back. Lucia was amazing and very helpful and very quick to respond. The cottage was immaculate. Thank you. We are a family of 4 adults. We couldn't have asked for a better home away from home, in Niagara-on-the-Lake. 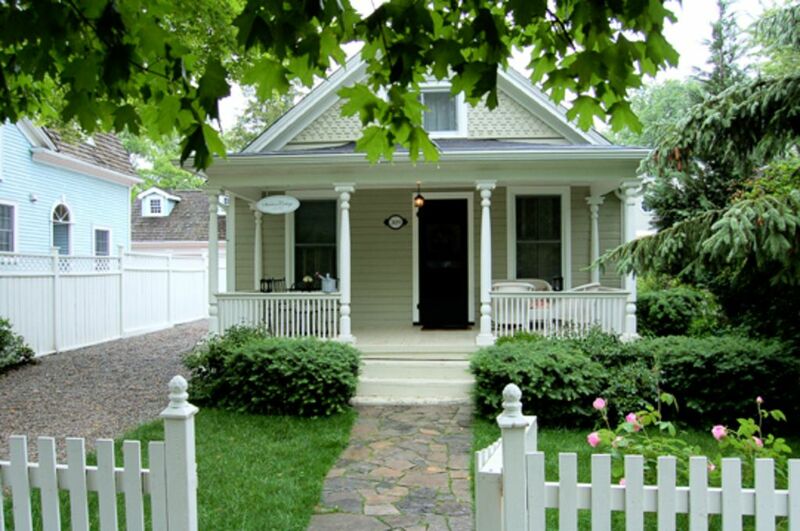 Charm and just so quaint! Walking distance to the Shaw Theatre, to the lake, to restaurants and shops. It truly was perfect. One night we stayed in and had a good old fashioned board game night. Oh how I miss my coffee on the porch in the morning. If I could, I would retire in this house!!! Vous recherchez plus d'espace? S'il vous plaît visiter notre propriété sœur La Flynn House, situé à quelques pâtés de maisons.